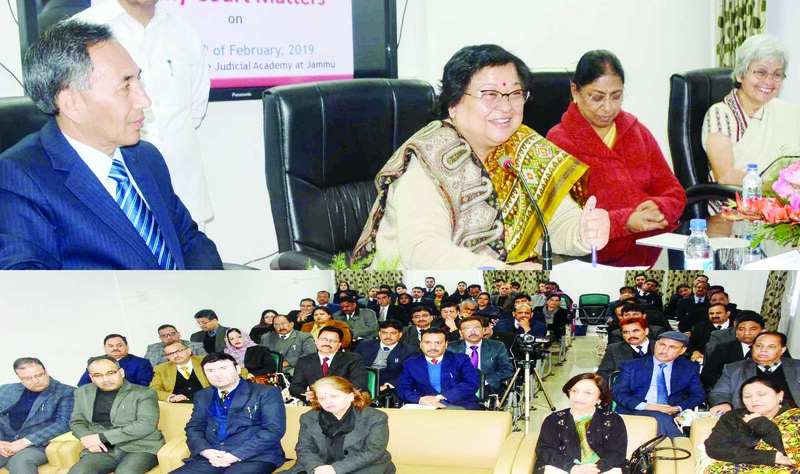 JAMMU, Feb 9: Jammu and Kashmir State Judicial Academy today organised Two Day Training Programme on "Sensitizing Judges on Family Court Matters" in the State Judicial Academy, at High Court Complex, Jammu. The District Judges and the Senior Sub-Judges of the State participated in the programme. Chief Justice, Gita Mittal, in her inaugural address said that sensitisation of all the stakeholders on Family Court matters is the call of the Hour and that holding of such training programmes will help in creating an atmosphere where family disputes may be dealt with utmost sensitivity. Further elaborating on the subject of the training programme, Chief Justice Gita Mittal emphasised that family harmony provides a sense of belonging and a feeling of security unlike many other types of relationships. Whether the disharmony emanates from within the family unit or from external sources, individual family member and the family as a whole can experience a range of negative emotions and consequences. She said unresolved conflict may irreparably damage a marriage and even the entire family. She wished that the Family Courts which would become operational shortly would deal with the Family Court matters with much more sensitivity, giving appropriate priority to resolving the disputes in a humane manner. He advised the participants to take cue from the life experiences and try to resolve the family dispute coming to the Courts on negotiated settlement, and in this process to inspire the parties to choose alternative modes of dispute resolution rather than involving themselves in procedural wrangling in the regular trial proceeding. He also spoke about the need for having specialised courts and sensitive atmosphere for resolving the disputes pertaining to the marriage and the incidental matters. He also gave an overview of the training programme and said that a Family Court Judge has multiple roles of a mediator, a conciliator and a settler in handling the sensitive matters. Resource Person Justice Manju Goel, Judge (Retd.) and Justice Roshan Dalvi, Judge (Retd.) deliberated upon the Gender Sensitization, Gender Perspectives and Matrimonial Mediation. Justice RoshanDalvi highlighted the need of sensitisation among the Judges, Conciliators and other persons who are essential to constitute a Family Court. She presented gender perspective which a presiding Judge has to be aware about while discharging the functions of the Court. She said that in our common behaviour we have developed in our minds some stereotypes about the role, status and the responsibilities of a woman, and it is commonly believed that a woman has the role of home maker only which is not a fact in the present scenario. It is requisite to shun such rigid ideas and to accept the reality that a woman is also an equal partner in the family and she has right of equality granted under the Constitution.